Looking for a creative and fun way for the kids to stay active? Check out our specialized traverse ROCK WALL! Our rock wall, which is approximately 40 feet long and 8 feet high, is geared specifically toward the children of all sizes and ability. 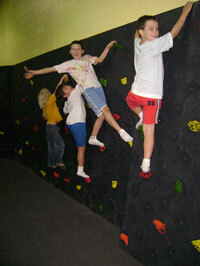 Rock climbing is a popular sport that creates a personal challenge and sense of achievement for each child. Kids can build strength and endurance while developing confidence through the sport. Parents can feel comfortable as kids make use of our safe, secure and size-appropriate climbing structure.